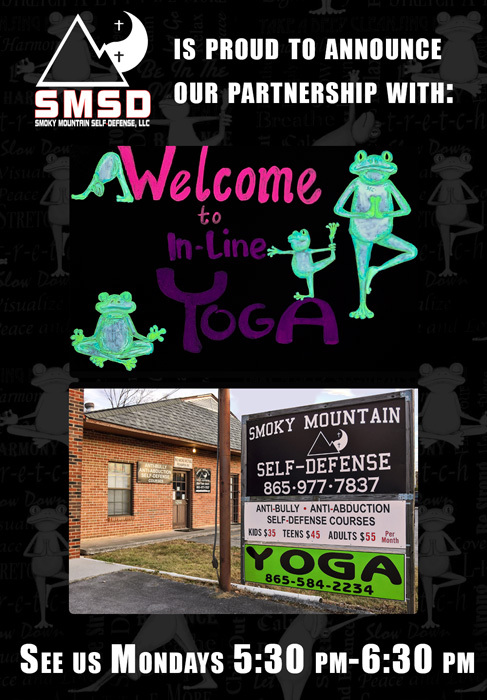 Smoky Mountain Self-Defense is proud to announce a partnership with In-Line Yoga and Instructor, Sharon Hatch. Avoid Manic Mondays now and start your week off right with Vinyasa Yoga classes at Smoky Mountain Self-Defense. Join In-Line Yoga Mondays from 5:30 pm – 6:30 pm. Beginners are welcome and encouraged to attend. Please bring your own yoga mat. Blocks and straps are optional, but handy. Learn more finding In-Line Yoga on Facebook or calling 865.584.2234!